charter is based in the port of Fethiye Bodrum Marmaris , Turkey and offers a luxurious cruising experience in both Turkish waters as well as the Dodecanese islands of Greece. 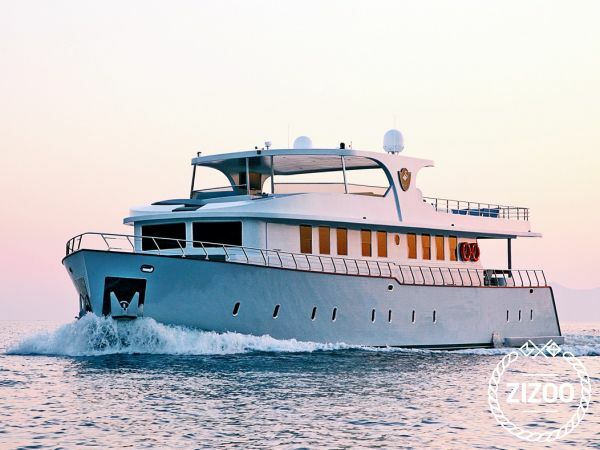 She sleeps 10 guests in spaciously designed 2 master and 2 twin cabins. Each en-suite cabin is furnished with air conditioning and satellite TV. The Simay S Trawler features a wide open well appointed jacuzzi on the flybridge, along with wet bar, alfresco dining and over-sized lounging cushions to enjoy stunning scenery during your travels. Alfresco dining is also available aft deck with swimming platform, and in the salon. There is additional lounging available at the bow. This beautiful yacht charter is powered by two 480hp engines with 70 lt per hour fuel consumption. Explore your luxury yacht charter options with Simay F Trawler. Ideal for family and couples only charters alike.